ATS, or Automobili Turismo e Sport SpA, was an Italian car maker and racing team that operated all too briefly between February 1962 and 1965. 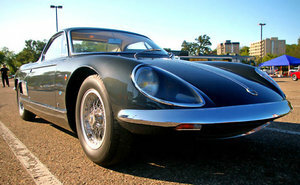 The nucleus of the new company was comprised of Carlo Chiti and Giotto Bizzarrini, who were both prominently involved in the development of the Ferrari GTO and, as refugees from the infamous Ferrari “Palace Revolt” of 1961, intended to mount a direct challenge to their former employer. Development of the basic concept of the car that eventually became the ATS GT actually began while Chiti was still at Ferrari, with the project aimed at producing the first mid-engine Ferrari. However, after the departure of Chiti and Bizzarrini, the concept was carried on under the auspices of the new ATS organisation. At Ferrari, the mid-engine 250LM developed concurrently, with V12 power rather than a V8, on the direction of Enzo Ferrari. With the sponsorship of a trio of wealthy industrialists including Count Giovanni Volpi, who founded the well-known Scuderia Serenissima, ATS developed both a road going sports car and a Grand Prix racing car. 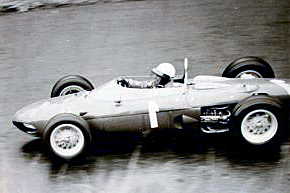 Personalities involved with ATS included 1962 World Driving Champion Phil Hill driving for the racing team, while a number of other famous drivers were engaged in the development of the road car. Sefarino Allemano, the famed Turin-based coachbuilder, constructed the road car, with its sleek bodywork designed by former Bertone stylist Franco Scaglione. The resulting ATS 2500 GT Coupé was initially powered by a mid-mounted 2.5-liter V8 engine designed by Chiti, with a light-alloy block and cylinder heads, a single overhead camshaft per cylinder bank, as well as a quartet of Weber twin-choke carburettors, producing 220 to 250 brake horsepower. Based on a competition-specification braced chrome-molybdenum tubular chassis with a fully independent suspension and four-wheel disc brakes, the resulting car was essentially a thinly veiled racing car, capable of exceeding 160 mph. The car made its debut at the Geneva Motor Show in 1963, where it created a sensation with its advanced mid-engine layout, bold, shark-like body design and race-inspired technical specifications. Ultimately, only 12 chassis were built, including just eight complete cars, with the company constantly struggling with inadequate working capital. 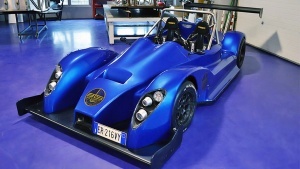 Volpi is reported to have left the organisation with the car offered here, numbered chassis 2004, along with the four remaining incomplete chassis, which he intended to develop into his own version dubbed the Serenissima using the Chiti-designed power plant, enlarged to 3.0-litres. Chassis 2004, which already had a 3.0-liter engine, also displayed the Serenissima badge on its nose, which was possibly added by Volpi later. The engine had a capacity of 2.5 liters; the GT sported two 42mm Webers, the GTS four 42 mm Webers. The GT was rated at about 210 bhp and 250 bhp for the GTS. A ZF all syncro five speed transmission was available on the street car, and a Colotti designed crash box was fitted to the GTS. The body, designed by the great Franco Scaglione and built by Allemano was very aerodynamic. The car was very light: 810 kilos for the road version and only 750 for the GTS. The top speed was of 240 km/h and 250 km/h respectively. 300 bhp, 3,000 cc mid-mounted light alloy V8 engine with single overhead camshaft per cylinder bank and four twin-choke 38 IDM Weber carburettors, five-speed manual gearbox in rear transaxle, independent front suspension with double wishbones, coil springs and tubular shock absorbers, independent rear suspension with double wishbones, leading radius arms, coil springs and tubular shock absorbers, and four-wheel Dunlop hydraulic disc brakes, mounted in-board at the rear. Wheelbase: 98.5"
Few could have imagined the impact the fall-out between Enzo Ferrari and several of his key engineers late in 1961 had for the Italian automotive industry. Before they formed Autodelta, designed the Lamborghini V12 engine or started manufacturing complete cars to name just a few of Carlo Chiti and Giotto Bizzarrini's achievements, the Ferrari 'defectors' worked together on a sportscar and Formula 1 racer that would directly challenge their former employer. Shortly after leaving Ferrari, the talented engineers formed Automobili Turismo e Sport (ATS) with backing from three rich Italian industrialists including Count Volpi. To cut costs and development, it was decided that both the sportscar and the F1 racer would be powered by a similar engine. Just what kind of engine caused the first and possibly fatal get together between Chiti and Bizzarrini. The former was determined to use a V8, while the latter felt his ideas for a V12 were all but ignored. Eventually Bizzarrini decided to leave the company and took with him the vital backing of Count Volpi. Bizzarrini later sold his V12 design to Lamborghini, so it did not go to waste. Undeterred, Chiti continued with his work and developed 1.5 liter (F1) and 2.5 liter (road car) versions of the eight cylinder engine. The compact eight cylinder engine was constructed completely from lightweight aluminum-alloys. The advanced design featured twin overhead camshafts and two valves per cylinder. Originally the V8 came equipped with four Weber Carburetors, but later a Lucas fuel-injection system was added as an option. Despite its modest displacement of 2467cc, the engine was good for 220 bhp. For the lightweight 'Superleggera' model a 250 bhp version of the engine was also developed. The high revving V8 was mated to a five speed gearbox, originally made by Colotti to Chiti's own design. Later cars were equipped with a slightly more civilized ZF five-speed gearbox. The drive-train was mounted mid-ships in a space-frame constructed from another light alloy. Suspension was independent by double wishbones, all-round. Stopping power was provided by Dunlop disc brakes with the rear ones mounted inboard next to the final drive unit. Chiti commissioned former Bertone designer Franco Scaglione to pen a low and sleek two-seater body. As quite often with Scaglione's designs, the result was breathtakingly beautiful. The fine lines were turned into metal (steel for the base model and aluminum for the 'supperleggera') by Turinese coachbuilder Sefarino Allemano. It took all involved little over a year to complete the first ATS 2500 GT, which made its debut at the 1963 Geneva Motor Show. One of the first mid-engined production cars and most certainly the first Italian car of this type, the elegant coupe was one of the true stars of the show. While the 2500 GT toured the show circuit in search for customers, the company raced the 1.5 liter Formula 1 car with 1961 World Champion Phil Hill as primary driver. This greatly drained the company's resources and the future looked very dim at the end of the year that had started off so well. For 1964 the Formula 1 program was axed and instead Chiti focused on the competition oriented 2500 GTS (for Superleggera). Fitted with an aluminum body and the 250 bhp version of the V8, two were entered in the Targa Florio. Both retired with ignition problems. It was the final appearance of an ATS in any form and after at least eight (some suggest as much as nineteen) examples were produced the Bologna based factory shut down. Chiti set up Autodelta, which would grow out to become Alfa Romeo's racing department. Many of the 2500 GT's design elements later found their way in the Alfa Romeo Tipo 33 racers and the Scaglione designed 'Stradale' road car. With few cars built and even fewer survivors, an ATS 2500 GT is a very rare sight these days. A great shame as the mid-engined two-seater was well ahead of its day and remains as one of the finest supercars built in an era that is hardly short on superb motors. Of the eight cars originally built of which five are known to have survived. Chassis: 2004 Chassis 2004 Fitted with a three liter engine, chassis 2004 was taken with him when Count Volpi left ATS. It features an unusually long nose and a unique rear-deck as well. The nose sports a Serenissima badge on the nose, probably added by Volpi. Shortly after taking delivery, the Count handed the car to former ATS employee Alf Francis, possibly as payment for services rendered. The longtime mechanic of Stirling Moss, tuned the large engine to around 300 bhp. The 3-liter V8 is equipped with four of the Weber 38 IDM Carburetors, which were originally intended for the Formula 1 car. Apparently Weber only built sixteen of these. Francis is believed to have registered the car for the road and used it quite regularly before selling it on in 1966. The rare ATS changed hands several times more before being acquired by Ed McNamara. At the time he already owned chassis 2001. In 2005 his estate eventually sold the car to a Costa Rica based collector. He had the mechanics restored before entering it in the Modena Cento Ore Classic in 2008. The ATS covered the 3000 km without a hitch. In the following months the restoration was completed ahead of an entry in the 2009 Pebble Beach Concours d'Elegance. The current owner has decided to sell the very rare 3-litre ATS 2500 GTS in the RM Auctions Automobiles of London sale on October 28. Offered without a reserve, it will definitely change hands. The car comes with an invitation for the 2010 Concorso d'Eleganza Villa d'Este. Chiti arrived at ATS and in a very short time was able to design and produce a nice formula one car with a new 90 degree V8 engine, making sure that the design was much different than the 60 degree V6 he had already designed for Ferrari. Chiti told Graham Gauld that took five months to design and build the first prototype. The GT car would boast a 2.5 liter variant of the F1 engine. According to Gauld Chiti stayed under 3 liters because he didn't want to compete directly with Ferrari in that class. A German team called ATS (Auto Technisches Spezialzubehör), owned by alloy wheels magnate Hans Gunther Schmid and not related to the original Italian team, raced in Formula One from 1977 to 1984. While Enzo Ferrari has gone into history as one of the most successful automotive entrepreneurs, his people managing skills, or lack there off, have led to serious problems on several occasions. The most telling example is the fall-out late in 1961 with a large number of his senior staff after he fired Ferrari's sales manager, Gerolama Gardini, for dubious reasons. All the people that were loyal to Gardini and requested him to be reinstated were subsequently fired as well. Among them was chief engineer Carlo Chiti and his right hand man Giotto Bizzarrini. Shortly after the 'Palace Revolt', the group of defectors was approached by a young, but very rich Count Volpi. He was a big racing fan and frequently entered racing cars under the Scuderia Serenissima banner. With so many experienced engineers available, he could now pursue his dream of building his own Serenissima road and racing cars. With further backing from two other wealthy industrialists, he set up shop early in 1962 and work was started to design both a mid-engined GT-car and a Formula 1 racer with successfully taking Ferrari on as the ultimate goal. Sadly there was little progress, due in no small part to a clash of egos with both the backers and also the engineers. Bizzarrini and Volpi were in one corner and Chiti in the other, which eventually led to a split in the second half of 1962. Volpi took the Serenissima name with him and Bizzarrini went on to offer his services as an independent consultant for many other manufacturers. The remaining group had to come up with a new name and chose 'Automobili Tourismo e Sport SpA', or ATS. Under this moniker a new Formula 1 car was launched in December of 1962. One of the main reasons Bizzarrini walked out is that he felt his ideas were completely ignored by Chiti, who had his mind set on a V8 engine. Bizzarrini did work on a V12 engine, but never even showed it to his colleagues and it is believed that the later Lamborghini V12 was based on this early design. For the Formula 1 car, Chiti's V8 displaced just under 1.5 liter and sported twin overhead camshafts. Initially four Webers provided the fuel mixture, but one point a Fuel Injection system was also tried. At its debut, an output of 190 bhp at 10,000 rpm was claimed. Mated to a Colotti six-speed gearbox, the V8 engine was installed in an unusually low spaceframe chassis. Suspension was by double wishbones all-round with the coil springs and dampers at the front fitted inboard. With a very small frontal area and an exceptionally low weight the ATS Tipo 100 looked like a top contender on paper. So much so that the team managed to enlist the services of 1961 World Champion Phil Hill, who had also jumped the Ferrari ship. He was joined by another former Ferrari employee Giancarlo Baghetti. Problems with completing the ATS factory caused the competition debut of the Tipo 100 to be postponed to the Belgian Grand Prix, halfway through the 1963 season. Looking at the state of the two cars, it was obviously still a rushed debut and neither car made to the halfway mark of the 32 lap race. The cars were further developed throughout the season, but it did not improve the performance or reliability much. In ten attempts, a Tipo 100 only managed to reach the finish once; seven laps down on the leader. Chiti had a new car ready on the drawing board, but it never materialized. At the end of the 1963 season, the team fell apart and ironically the assets were bought by Count Volpi, which he used to finally construct his much desired Serenissima cars. Sadly, they made a similar impression as the ATS cars. Together with the two Formula 1 cars, ATS also constructed between eight and ten examples of the 2500 GT mid-engined sports-cars. 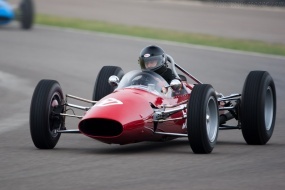 One of the Tipo 100s was bought by a British team, who used many of the mechanics for the Derrington-Francis car raced once during the 1964 Formula 1 season, again with little success. 50 years after the foundation of Automobili Turismo e Sport, the new ATS set out to produce two exciting models that re-invent the classic originals, the 2500GT and the Sport1000, plus add a third new model, the beautiful Leggera. Based in Borgomanero, northern Italy, ATS’s facilities are modern, highly specified….yet deliberately modest. Just like ATS of 50 years ago, the modern ATS wishes to remain relatively small, highly exclusive and very close to the people that matter the most – ATS customers and drivers. The original creators of ATS, Carlo Chiti, Romolo Tavoni and Giotto Bizzarrini, worked to a simple philosophy – light weight and efficiency. All three of the new, modern ATS models have been developed using the same clear vision, utilizing laser cut, light weight chassis methodology coupled with advanced, high output, compact engine technology. This has allowed ATS to achieve levels of performance and driving pleasure far beyond those achieved by vehicles costing considerably more. More style, more performance, more exclusivity, more pleasure...but less cost, this is motoring the ATS way! The fantastic new Sport model was designed and developed to meet some very clear criteria. Quite simply, it had to offer the best performance, the best handling and the best quality within its sector. However, it also had to represent the best value within the track/race car sector and be priced below established, over-priced rivals. Lastly, it had to be backed up with superb technical support and a simplicity of design that allowed easy and cost effective maintenance and repair. ATS have managed to hit all these targets. Not just that, we’ve also developed a ‘road legal’ Sport for those that want to enjoy its power and handling on the open road, or who appreciate the convenience of driving their track car to and from their chosen circuit. Simplicity, lightness, power, efficiency and high value – the ATS Sport range. The ATS Leggera represents a completely new direction for the ATS brand: it is the first ATS front/mid-engined, rear wheel drive car that we’ve ever developed and we’re justifiably proud of it!! The designers have deliberately bestowed the Leggera a very classical look, reminiscent of the finest and most beautiful spiders and roadsters of the 60’s. Elegant, graceful lines combine beautifully with a very purposeful stance to deliver a car of rare character and style – but also one that delivers unrivaled driving pleasure (on both road and track). True to the ATS philosophy, a combination of a strong, light weight chassis, modern high efficiency engines and top quality components ensure that the looks are backed up by the drive – all within a very high value package. Beauty, lightness, power, craftsmanship and high value – the ATS Leggera range. The stunning ATS 2500GT is the ultimate expression of the ATS ethos. Each car is built around the needs of each individual client, delivering the ultimate driving and ownership experience to each driver. A purity of line that harks back to the classics of years gone by, but with a driving experience delivered via a light, rigid chassis and the very latest engine technology. Only the very best components is deemed good enough for the GT, only the very best craftsmanship is deemed worthy. Stunning beauty, intoxicating performance and peerless luxury – the ATS 2500GT. The return of ATS brings new opportunities to individuals faced with choosing a car from the current bland automotive world. Exclusivity, beauty, lightness, efficiency – and value. The ATS ethos now allows you to express yourself and truly stand out as an individual.